Stronger data protection and a digital bill of rights are a core part of how the Greens want to change Europe. Europeans should be entitled to their privacy and it must be respected. GEJ:What were your objectives and goals at the beginning of this legislature, when you first arrived in the European Parliament? Jan Philipp Albrecht: For me it was clear that the Green Group in the European Parliament was the group which was into the whole digital rights issue already. We had the fights on the software patents and data retention directives in the previous legislature. And we knew that there would be challenges for freedoms and rights in the digital environment, and they came quite soon. And the biggest fight for sure was the ACTA agreement, where we wanted to avoid a punitive approach to the sharing of information on the internet. Especially when it comes to remixes of videos, to artistic content, and to free communication. And of course we wanted to achieve standards for fundamental rights. And they weren’t included in the ACTA agreement. Yes, and what made this victory possible? It was a hard struggle probably. We worked for almost two years on rejecting that agreement, on working against the Commission’s proposal in negotiations. And also against a majority of the Parliament, which just wanted to conclude the agreement, until there was public awareness in Europe and people took to the streets and protested with us. And we managed to get a majority against the agreement in the Parliament, and that was for sure a huge victory. Greens are always successful if they have strong connections to social movements and to civil society. 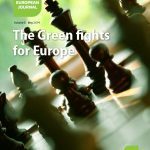 Was the link between the social movements and the Greens in the European Parliament a crucial element to explain this victory? This was really important for us. Greens are always successful if they have strong connections to social movements and to civil society. And as we have had a very consistent policy with regard to digital rights, these movements were fighting with us. And they helped us to work against the ACTA agreement and to build a majority against it. Just to give you an example, in June 2012, Avaaz – which is an supranational democratic community of 20 million members – presented a petition that was signed by 2.5 million citizens in a few weeks, calling on MEPs to reject ACTA. Combined with a telephone and mailing campaign, it overturned a majority that was initially supporting ACTA. All this helped also to change the position of the other parties. What was the position of, for example, the Social Democrats on this issue? For a very long time, the majority of the Social Democrats were completely in favour of adopting the ACTA agreement. So they also wanted a document that was not transparent. And we always had to fight for it and convince them. And only when we were speaking in public debates did the Social Democrats change their minds, and also some Liberals and Conservatives changed to our position. And what was the attitude of the far-left in this debate? They were most of the time absent in the debates. They were not really there, because they did not have really a profile on digital rights. But at the end it was clear that they were voting with us when it was on transparency and on strengthening digital rights. So we had to do the job for them. But at the end we could also count on them to vote with us. Could you sketch for us what are the main challenges of digital rights for the next legislature, on the European level? What is the top priority for you? We can already see these challenges right now. They are already there. This is on data protection, and privacy, on copyright reform, which will come, it’s on net neutrality regulation, which we just debated in the Parliament, and which will be in the next Parliament too. And of course it’s also the whole debate on the negotiations for the TTIP agreement (the EU/US Trade Deal currently under negotiation), which also has an effect on the fundamental rights in the internet. The NSA scandal, which did not provoke everywhere the same public discontent, gives me the feeling that public awareness of the protection of privacy is not really sufficient in Europe. There seems to be some kind of fatalism. The people know, ‘yes, we are all controlled, we are followed by the NSA’, but how can we change this?’ I was personally really surprised by the lack of reaction after the Snowden affair. Do you share this point of view? And how can we go against this state of mind? We have to better explain to people how important it is for our freedoms and for our self-determination in society, both as citizens and as consumers, that we have strong data protection rights. That we can decide which data we want to make public or provide to companies. And that we have the right to privacy and private communications. And that is endangered of course because of companies and because of security institutions. And thereby, I think we have to go on the offensive, but we are on a very good track and we can get a majority on this. OK, so you think the European Parliament has a real competence and role to play in this, in order to increase the protection of digital rights? Absolutely. Just yesterday (March 13th) in plenary MEPs voted overwhelmingly to adopt the Data Protection regulation that I drafted. That was one of our most important projects for the Greens in the European Parliament. And we really showed that we take care of the online rights of individuals in the digitalised world. Can you explain the main outlines of this new regulation? The new regulation tightens the EU’s existing data protection rules, which have been in place for 19 years and urgently needed updating. It calls for strict safeguards to protect the data of citizens when that data is transferred to non-EU states. It also ensures that the same laws apply in all EU states, which makes it easier for companies and organisations to do business. Are there real guarantees that this will be complied with? The report calls for strict penalties for companies that break data protection rules. Firms that break the rules should face fines of up to €100 million, or up to 5% of their annual worldwide turnover, whichever is greater. This is a far greater deterrent than proposed by the European Commission, who had suggested penalties of up to €1 million or 2% of worldwide annual turnover. Any organisation would have to ask the permission of the relevant Member State’s data protection authority before transferring that data to a non-EU country. Organisations would also have to inform the person concerned. The citizens of Europe expect us to deliver a strong EU wide data protection regulation. If there are some Member States who do not want to deliver after two years of negotiations, the majority should go ahead without them. Are there other key measures? The new regulation would put strict limits on using information stored to profile a person for advertising purposes. Companies would also have to ask for explicit permission to process your data and ensure that any privacy and user agreements are explained in plain, easy-to-understand language. The citizens of Europe expect us to deliver a strong EU wide data protection regulation. If there are some Member States who do not want to deliver after two years of negotiations, the majority should go ahead without them. Was it an easy legislative process? The regulation faced a record 4,000 amendments, mostly copied and pasted from industry lobbyists. However most of these were defeated because there is a broad consensus in favour of strong data protection in Europe. After the latest revelations from Edward Snowden it became unlikely that proposals for cutting protection would be supported. Unfortunately the Parliament rejected an amendment from the Greens to the report on mass surveillance that would have called for EU Member States to grant protection to Snowden in light of those revelations. The issue of the digital rights seems to be one of the key challenges of the TTIP negotiations. Are they really endangering the results of the work of the European Parliament? The US industry has a massive interest in using the trade agreement to undermine our data protection standards and is lobbying heavily around it. If the trade negotiations go wrong before we have concluded the work on the EU data protection reform, we might even be barred from improving our data protection and digital rights standards because US companies could reject them under the investor protection clauses that are also foreseen in TTIP. What should we do in order to strengthen the “open source approach” in these negotiations? Free and open source software and other open products and services often do not have an investor in the classical sense, but are collaboratively built by the community. We therefore have to ensure that proprietary software and related goods and services are not discriminated by trade provisions such as investor protection clauses. And of course we have to walk the talk and conduct the negotiations themselves in a much more open and inclusive manner. Something is fundamentally wrong when negotiation documents are shared with hundreds of lobbyists and not the citizens that are affected in the end.